Flavie : I had never been to Sweden. When I saw it from the plane I was very happy because of the long journey. It was beautiful, with snow everywhere. There were frozen lakes and huge forests. There were also a lot of little islands on the sea. When we arrived at the airport, everybody was so excited. At the moment we went out to go to Lindome, I was surprised bevause it was not so cold as I had imagined. I was eager to see the school and my penfriend. During the drive I noticed that all houses looked alike, made of wood with different colours. We went to school to meet our penfriends. We waited and a few girls from the project came to speak with us. They were friendly, there were three who welcomed us. After we went in class to join our hosts. In class everybody had their mobile phone, a girl’s phone rang and she picked up. We were all very surprised. Then I went to my penfriend’ s house. She lives in a house out of the city but not really in the country side, a ten minutes drive from the school. While we were waiting for the bus she introduced me to her friends like Amanda and Mathilda who are also in the project. We arived at her home. Her parents were not there. We spoke a little bit but she was a little shy and me too. So we watched a movie in English. I had dinner with her parents and her. Her parents didn’t speak a lot either. We ate chiken cooked with pepper and patatoes. I went to sleep early because i was very tired. Noémie : When we arrived in Sweden I felt very happy to see a new landscape with a lot of snow everywhere, it was amazing ! Moreover I loved this wheather : very cold and dry in the same time. I found Swedish people kind with me they have a really good personality and they are open-minded. Gunes : My first impression is that it was very cold. We were received at the airport by a teacher. Then we went to the High School. We met students and talked about the program of the week. I met my pen friend , Ella. Her family welcomed me very well. She has two small sisters : Alva and Irma. In the evening we got to know each other during the meal. We ate potatoes and meat . The Swedes eat earlier than the French : around 18:00 . Gunes : I had read on the Internet that Swedish people can eat fish in the morning. Then I asked them if it was their case. They laughed. They prefer ham and cheese. Flavie : In the morning when we arrived at school we were with other students who are involved in the UNESCO project. Swedish students started to present associations in Sweden which help immigrants like Polish or Afghan people, sport competitions to help foreigners to integrate the Swedish society. They also introduced foreigners who live in Sweden, like Paola Lopez from Salvador who left her country for safety reasons. After Capucine and I presented the art project that was done in our school. I was a little stressed to speak in front of people I did not know but it was a small group so it was nice. Mathilde : We had our presentations of slide shows to show our projects on Kermoysan as well as our art project . I was a little afraid, because the English and the Swedish people speak English very well. I was very surprised by the presentation of the Swedes because they used laptops, etc.! They all have laptops which are supplied by the school. During the lesson they listen to music. The teachers lock the classrooms. There is no bell. Gunes : Then we visited the school. The students can choose between several Optional subjects : cooking, sewing or woodcraft.In the afternoon, we attended different lessons. In French , we talked with Swedish students about our school system in France. In Sweden the rules are less strict during class. For example, they can have their phone, even during lessons ! Education is free for them because the government wants everyone to have an opportunity to succeed by going to school. In Sweden, everyone has an Iphone. Even 10 year olds. When they are in class, they can reload them … from the ceiling ! This was surprising. “ Qu’est - ce que vous voulez boire mademoiselle ? DJ Avicii, and Swedish House Mafia . Flavie : We went to lunch at 11 : 00, they eat very early. Their cantine is smaller than ours. It was good and I tasted crackers. After lunch presentations we went in classes. First we went to a French class where we answered questions from students about France. We learnt that they have at the most five hours of class. After we went to English and History class. It was fun ; it had been a while since I had not played. We go back to Lindome by train too and I went to my penfriend’s home to eat. When we arrived she explained to me that her dad was out to see the hockey match in Goteberg so we ate just the two of us . We ate a swedish speciality : meatballs with puree. As the sun goes down early It seemed like it was 23 : 00. So I went to sleep. Flavie : At 9 : 30 we went to the ice rink. It was a huge room with clear ice and a logo on the center. It was very funny. I was surprised because all the Swedes skate well. We stayed on the ice rink until 11 : 00. We ate at the ice rink it was really good, I loved the sauces. After we went to the Museum of World Culture by train to see an exibition called Africa is a great country. But before a guide explained us the story of the Wiphala. It was a little long, but very interesting. Then we saw the exibition about Africa. It was beautiful, big pictures with different parts of Africa with contrasts and clear colors. Gunes : In the afternoon, we visited the Museum of World Culture. The guide told us about Kallawayas (doctors).The Kallawaya is a group originating from the Bolivian highlands. They are travelling physicians with extensive knowledge in various illnesses and medicinal plants. The Kallawaya were the family Doctors of the Incas. For a long time ,their skills were prohibited. Today Kallawaya medicine is internationnaly recognized . Flavie : Afterwards, we went to the city of Goteborg, it was not really funny because I was the only French with two English and three Swedish students. We did not visit the city : we went to a coffe shop to eat and then we went to a gift shop. So I was a little bit disappointed. We came back by train and Ina had a meeting with her professors so I went to the library to wait. It is funny because the TV is in English but books are translated. We ate pizza. While we waited we noticed that there are pizzerias in every country like Mc Donalds. I also tasted two Swedish candy : one green with chocolate a little strange but it was good, it tastes like frangipane with more spices , and I also tasted a little black one it was liquorice, a speciality from Sweden, with salt around …. it was not really good. Her father, Janne, told me about the Frölunda Indians, his favorite hockey team, he was at their match on tuesday. He showed me his jersey. To close this day we watched another movie in English too. And I realized that I understood both movies without subtitles so I was very proud. In the morning I went to a fashion class. Ina showed me her poster of Coco Chanel and I did a bracelet but I am not very patient so I didn’t finish. Then we went to the cantine to eat at 11 : 00. We ate rice with kebab. It was really good. Afterwards we did activities made by English students. It was funny, Swedish and French students were mixed and the English presented games. We worked in teams after with a game whose aim was to build a wood blocks tower without touching the blocks . We could use another piece of wood linked by strings. It was really funny. We also did ranking but could not speak. We spent a good time together. Ranking people : How was this done ? It was the end of class for us. So I asked my penfriend to go to Goteborg because I still had a lot of money. Ina told me that there are always lots of people in the big mall. I found a jewellery shop with beautiful rings so I bought one for myself. I also bought biscuits and chocolates for my parents and my grand- parents. I spent the rest of my money on candies ; there are a lot of candy shops in Sweden and it is very cheap. After we had dinner with Swedish specialities. It was really good. I definitely love Swedish meatballs. There was a house made of gingerbread and sweets they do for Christmas. I also tasted warm wine ( without alcohol) with spices ; it was too sweet but it was good. Swedish food is made with a lot of spices, which astonished me. It was really funny, after the dinner we sang and we danced. They all have computers for the elder and tablets for the younger ones. During class they can have their mobile, they all have a mobile even the youngest. Most of them have Iphones . When I went shopping I saw that mobiles are cheaper than in France : in Sweden you can buy a smartphone for 499 koronna ( 65€ ). They can also listen to music during class. Teachers are really cool too. They have classes we do not have in France like cooking, wood craft or sewing. They have all a very good English because TV is in English. They also read books in English, for English class. We went to an English class, the teacher asked us why we did not speak English well ; we did not know how to answer this question because it is true. They do not have detentions. If they have a sanction it is just homework. 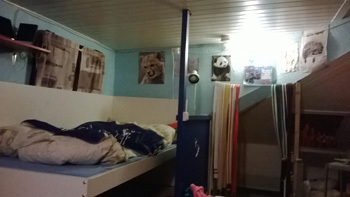 It is forbbiden in Sweden to compel a student to stay after class. During classes doors are closed but students can go out or in when they want to . Almas is not a big school. But the equipment is good. Like in the gym or music class. The cantine is small. They do not have starters, only a main course and a dessert. And they do not have bread but crackers with butter. But it is so good. They also have a library with books in Swedish. fairies bring a coin.I told her that in France, we put the tooth under the pillow and that’s the little mouse who brings a coin. Noémie : I think my favourite moments were at dinner when all parents and penfriends were with us. It was really pleasant to eat Swedish specialities and talk to them at the same time. I could talk about the culture and the differences between Sweden and France. And sometimes, it was funny to see their reaction. When I asked the dad of my penfriend about ski resorts, he told me : « Even if there is not enough snow in the village, I go skiing because I love this ! ». Then I looked out of the window and it was funny because I imagined him skiing whereas there was not enough snow outside. Mathilde : In the evening we ate at my correspondent’s with Noémie and Capucine ; we ate vegetable mixed with pasta and as a desert pineapple with ice and yoghurt with fruit. Then the girls went out. I offered presents to the family they really appreciated and thus we enjoyed the famous Breton specialities. Then her small sister Elsa played me horn tunes it was really great and cute from her. Flavie : My penfriend is named Ina Lisleby she is 15 years old. She has one half brother but he lives with his mother. Her parents’ names are Helen and Janne. Her mother is a cook in a school and her father makes doors. She also has a dog, Smorfen, which means Stroumph in French. I slept in Ina’s bedroom. She collects little animals. She practised 7 years of karate so she has all the belts from white to brown. Her father explained to me that they have a well in their garden to have water so the water is very clean. Dalecarlian horses are at the origin, horses made of wood by a grand father for his grand-daugter. When she had a little brother he made one for him too and it became a tradition in Sweden. Now they are handmade and you can’t find twice the same. 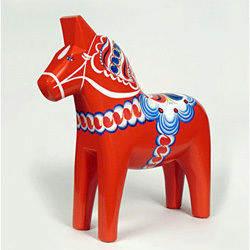 I bought it as a souvenir from Sweden but I think, they cheated on me because I bought it for 199 koronna. I noticed that they eat early. And several times in a day, more than in France. The sun sets at 17 : 00. When we went to the museum we passed behind a high building where we can see all Goteborg from the top. It was a swimingpool. We also saw the « walk of fame » of Goteborg. And we saw a dinausor walking on a frozen lake. It was a really good trip. It was very interesting to see another culture and way of life. We had an extraordinary week. Gunes : It was the day of departure. I spent good time in Sweden. There were beautiful landscapes. It was very interesting to discover new landscapes, new languages , and other cultures. Capucine :It was a great trip where we were able to discover differences of culture, various personalities and beautiful landscapes. My host family was perfect for me, the younger sister of my correspondent made me drawings ; her mom left me a letter where she said I can come back in Sweden when I want and I shall always be welcome to them. I think Swedish people are very welcoming, very smiling and especially very open-minded. The families with whom I spent my evenings talked a lot with me and asked me many questions about France, and I could ask questions about their lifestyle in Sweden. I think that I will come back to see them, because I like this country a lot and I would like to spend more time there. I find that the fact that our correspondents and their families don’t speak French at all was a good thing because we had the possibility of speaking only English.